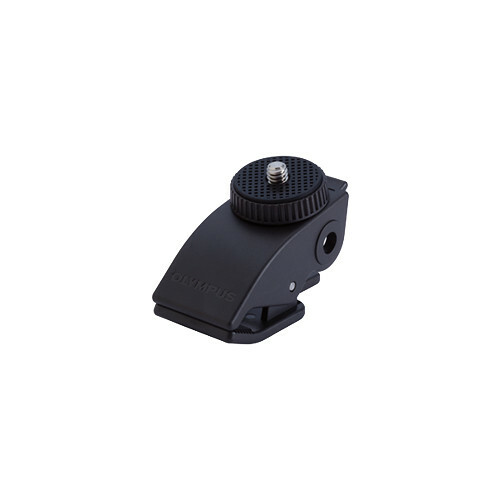 The Olympus CL2 Stand Clip For LS-12 and LS-14 is a plastic molded clip that threads into the 1/8" tripod hole on the back of the LS-12 or LS-14 field recorder and attaches to a microphone stand. Alternatively, the clip can be placed on a table or other flat surface to reduce the amount of surface vibration picked up by the field recorder. Box Dimensions (LxWxH) 2.4 x 2.0 x 1.7"
CL2 Stand Clip For LS-12 and LS-14 is rated 4.0 out of 5 by 1. Rated 4 out of 5 by Brett M. from Not using it for traditional reasons First off, I need to say that I am not using this in the traditional manner. I purchased this for use with my TASCAM DR-40 as I was having a difficult time finding an actual clip so I could clip the unit to my belt. It's a bit bulky for that purpose, but it still works.